Felipe Calderón served as the 65th President of Mexico from 2006 to 2012. Prior to his presidency, Calderón was Secretary of Energy (and in that capacity Chairman of the Board of PEMEX and CFE) and director of BANOBRAS (Public Works Bank). He was also a Congressman, leader of the National Action Party (PAN) in the Congress, and Secretary General and National President of PAN. 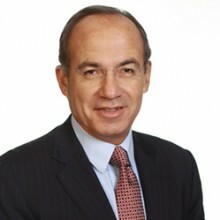 President Calderón has a law degree from the Escuela Libre de Derecho, a Masters in Economics from the Instituto Tecnológico Autónomo de México (ITAM) and a Masters in Public Administration from the Kennedy School of Government at Harvard University. Under his administration the Mexican economy registered stability and economic growth. Despite the impact of the 2009 international economic crisis, he boosted competitiveness in Mexico by deregulating the economy, promoting free trade, competition, private investment and technical education, as well as increasing investment in infrastructure to unprecedented levels. He also led an unmatched effort to enforce the rule of law. During his tenure, Mexico became one of the most important exporters in the world, exporting 60% of the total manufactured products in Latin American and Caribbean Region. When he took office, Mexico was the 9th largest exporter of vehicles in the world, and by the end of his administration it was the 4th largest, surpassing Spain, the UK and the US among others. President Calderón chaired the G20 Leaders Summit, the most important global forum for heads of state and government. He also chaired the UN COP 16 Climate Change Conference, and was recognized as a global leader on environmental issues. He has been named “Statesman of the Year” by the World Economic Forum, and “Champion of the Earth” by the United Nations, among many other awards. Currently, he is the Honorary Chairman of the Green Growth Action Alliance, President of Sustainable Human Development Foundation, Angelopoulos Global Public Leaders Fellow at Harvard Kennedy School of Government, Member of the Board of Directors of the World Resources Institute and Chairman of the Global Commission on the Economy and Climate.